'The Most Informative Blog' on GoodHomes Awards 2013.
just around the corner. I know a lot of my readers were waiting for the post on Diwali Decor Ideas. Rangoli at entrance make it cheerful and inviting. 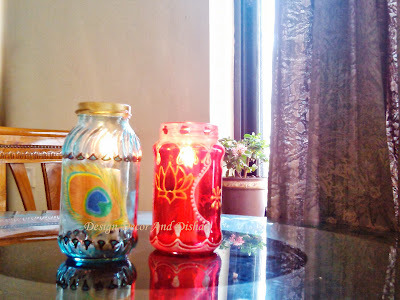 Make one with colors or with petals, put some diyas or candles and see the mesmerizing effect. Toran made of marigold flower strings and mango leaves add perfect festive cheer. Bright and vibrant color walls add to festive glow. Give a fresh coat of bright color to your walls and you are all set to welcome festivity. Bring in greens and don't forget the flower power. Strings of marigold on walls give a festive look to the home. Take out all the lanterns, candles, tea light candles, diyas and lamps. It's time to display those beauties all around the home. Apart from this there are lot of things that you can do to make your home look pleasing and inviting. Cushions specially silk or brocade with bling look perfect, use some nice matching throw and rug for a cozy look. Make a cluster of pillar candles and tea lights put one decorative mirror behind the arrangement. This setting will double up the charm and glow of your space. Hope you will find these tips interesting and will try out some to make your home ready for the biggest festival.